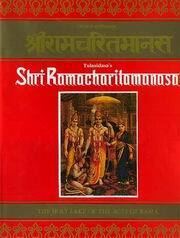 Ramacharitamanasa is the most excellent piece of work in Hindi literature. Sri Ramacharitamanasa of Goswami Tulasidas enjoys a unique place among the classics of the world literature. It is one of the best poems of the world. This book is an excellent specimen of ideal duties of a sovereign, ideal household life, ideal conjugal life and other ideal rights of human beings. It is quite impossible to find some other literary work in the world which contains highest level of devotion, knowledge, renunciation, dispassion etc. The book represents the wonderful example of divine sport displayed by the Lord in human form. It is universally accepted by all classes of people. Reverently recitation of the verses of this book, and acting upon the instructions as given in the book make human beings able to attain divine bliss, there is no doubt about it. Gita Press has published this book in various sizes King-size, voluminous, in book size, medium size, and small size (manual). Sri Ramacharitamanasa published from Gita Press is considered to be authentic as there is no interpolation in it. Procedure of recitation of verses, brief biography of Goswamiji, the composer, and the Arati song have been given in all the editions of Ramacharitamanasa. The presence of a copy of Sri Ramacharitamanasa published from Gita Press in each and every home at least in India is a beautiful example of its popularity.